Yes Clive, it is a bit of a mystery as to why the absolute temperature isn’t more tightly constrained. Apparently models are tuned for top of atmosphere net radiation. If their ocean heat uptakes are roughly right as they seem to be, one would guess the temperature would be close. Perhaps there are issues with the model’s tropospheric hot spot reducing surface temperatures in the topics or some problem with pole to equator gradients. Another possibility is that some of the colder models have ocean heat uptake that is a lot higher than reality. A simple 1-d energy balance model more or less gives you the correct answer. However, attempting to model everything in 3D is ambitious but clearly is still not fully there. It must be possible though because the earth’s climate has been remarkably stable for millions of years. One further question Clive. Are your model temps for SST plus air over land or for air temps over the ocean? It may make a difference. The models are from the original CMIP5 archive, so no they are not blended SST over ocean and TAS over land. This does make a difference and I have looked into that again recently. 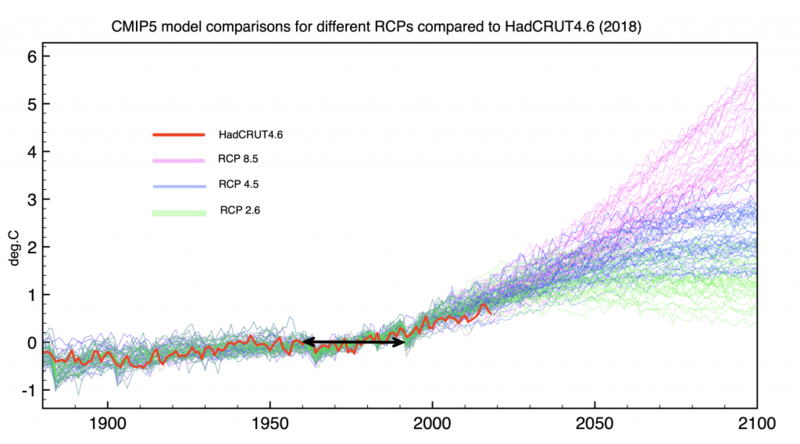 Blending reduces model warming projections slightly making the agreement better. 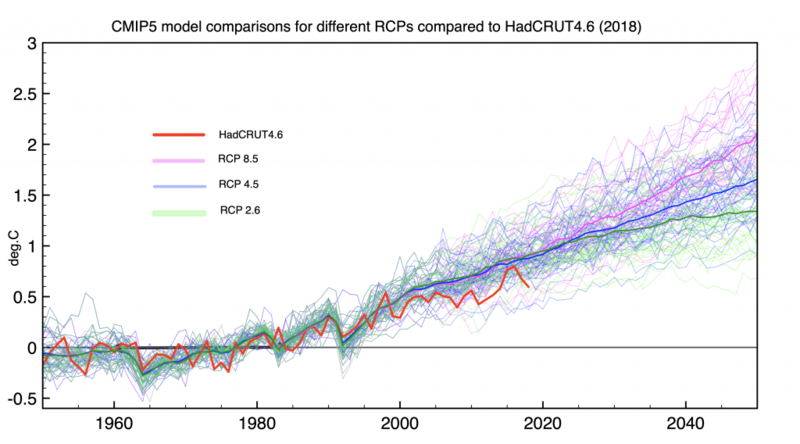 The effect is simply to reduce the model average predicted temperature(anomaly) by about 0.06C in 2018. This alone doesn’t close the gap though . The ensemble mean is an estimate of the forced response of the climate. The observations are composed of the forced response with the unforced response superimposed on it. There is no reason to expect the observations to lie any closer to the ensemble mean than any member of the ensemble (i.e. the obs should be within the spread of the model runs most of the time, but it is important to remember that the ensemble spread doesn’t represent all of the uncertainties, e.g. parameter uncertainties). Seems to me Dikran that your standard is so low as to guarantee the models will never be disproven. Falsification is not a useful standard here. Sometimes CFD modeling is almost certain to fail particularly when computing is so inadequate to what would normally be thought of as required to have any chance. Clive’s data seems to me to mean that climate models are not useful for decadal predictions. How long will the data have to remain much lower than the model mean for us to conclude models are not useful for centennial predictions? We kind of already know the long term results are not well constrained because the truncation and subgrid model errors are so large and ECS can be engineered over a broad range. The difference looks to me to be about the thickness of your red line and graphically is insignificant. 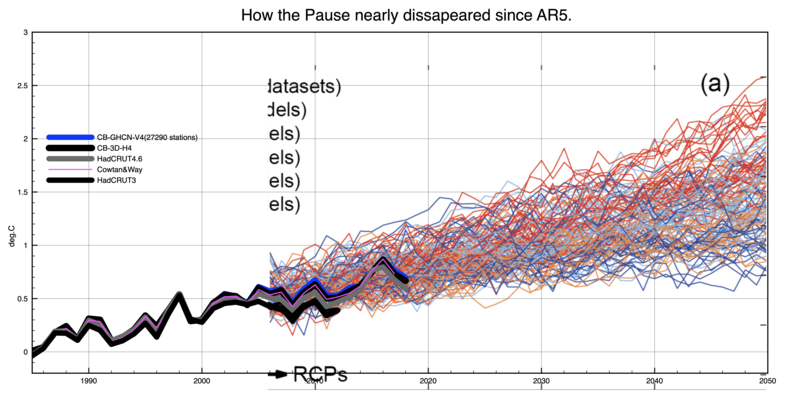 What about showing a graph without the science fiction scenario RCP 8.5? Clive what happens if you include the infill to the pole (triangulated) or Cowtan and Way? Thanks for that! I was a bit confused by the pale colours you used in your latest graph, but the range of the CMIP5 wiggles is identical with your earlier graphs. Clive, nice work. I’ve been tracking NOAA’s Climate Forecast System Reanalysis (CFSR) results for several years now and one of the many parameters included in the CFSR is the surface air temperature at 2 meters above ground level for 0.5 degree latitude/longitude grid cells (720×361 grid). 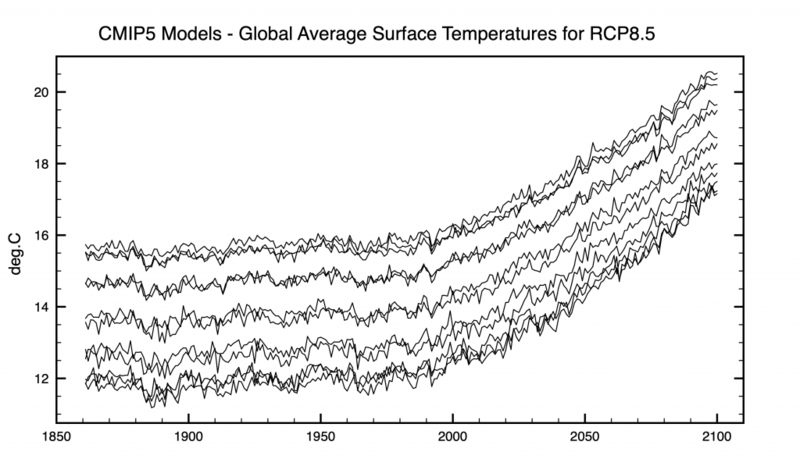 The CFSR output indicates a global mean surface temperature (2-meter air) of 14.2C for 1979 rising to a peak of 14.9C in 2016 and back down to 14.7C for 2018, which is a net 0.5C rise in 40 years. The annual averages hide the annual cyclical swing of about 3.9C seen in the monthly GMST. I’d be curious to know how well the models handle this annual cycle. Here’s a graph of the monthly GMST for 1979-2018 that includes a centered running 12-month average and a linear fit to that running average. Descriptions of the above graphs can be seen here along with some additional graphs that are updated monthly. Well, now that I’ve updated my monthly graphs, the graph images I linked from my page are gone in my comment above. I thought WordPress kept the old graphs when the were linked. Apparently no longer. At any rate, Clive, I linked to a couple of your graphs in a post here, including credit for your graphs at the bottom of the post. Thanks. oz4caster, Just went to your blog and like what I see there. You’ve done some quite extensive analysis.